What’s your favorite thing about the iPhone X? Maybe it’s the gorgeous AMOLED display, or perhaps it’s the industry-leading camera that seems way too good to be found in a smartphone. Okay, now let’s talk about your least favorite thing: battery life. It’s not bad when you have a normal day at work or at school, but if you have a day with heavy usage there’s simply no way you’re going to make it without recharging. 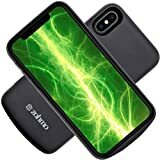 Well, unless you pick up a Zohmo iPhone X Battery Case, that is. It’s the slimmest iPhone X battery case on Amazon and yet it still packs enough juice to double your iPhone’s battery life. What more can you ask for? It’s on sale right now for $24.95 if you clip the on-site $5 coupon, so grab one (or two) while it’s still discounted.